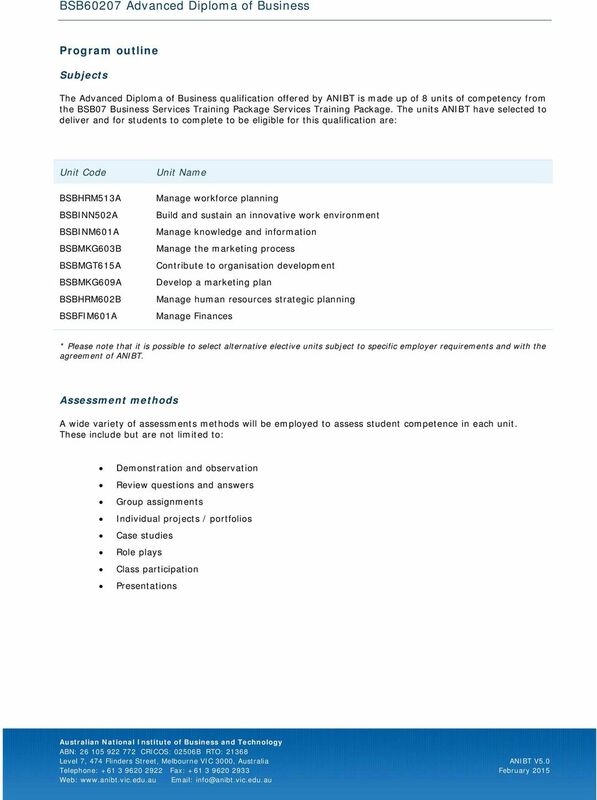 Download "BSB60207 Advanced Diploma of Business"
3 Entry requirements It is highly recommended that students are currently in a workplace or have access to a workplace for this course. For Advanced Diploma level courses, the recommended minimum level of education is Higher School Certificate or equivalent or relevant qualification (at Certificate III or above) or relevant vocational experience. 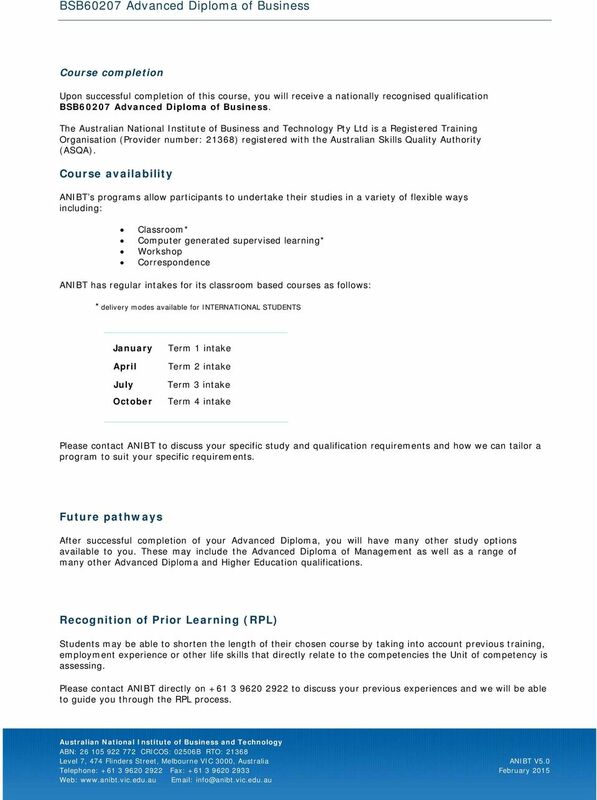 In addition, students may enter the qualification through a number of entry points demonstrating potential to undertake vocational education and training at advanced diploma level including: after achieving BSB50207 Diploma of Business or other relevant qualification/s; providing evidence of competency in the majority of units required for the BSB50207 Diploma of Business or other relevant qualification/s; with substantial vocational experience in a range of environments, acting in a range to senior support or technical roles. For international students Please check with the Australian Department of Immigration and Border Protection regarding international students enrolling into any on-line only based qualifications. The Australian government publishes rules for English language proficiency for international students applying for entry to vocational training. You should establish your country s assessment level by reading the DIBP rules at Be aware that the rules may be changed during Generally, to demonstrate English language proficiency for doing a Certificate or Diploma course, a learner with English as a second language should have one of the following test scores: Test IELTS PTE Ac TOEFL ibt TOEFL PBT Cambridge Score B ANIBT also accepts completion of a recognised equivalent English preparation course from an accredited ELICOS provider. Admission may be approved if the language of instruction in the student s home country is English or if English has been the language spoken in the student s home. 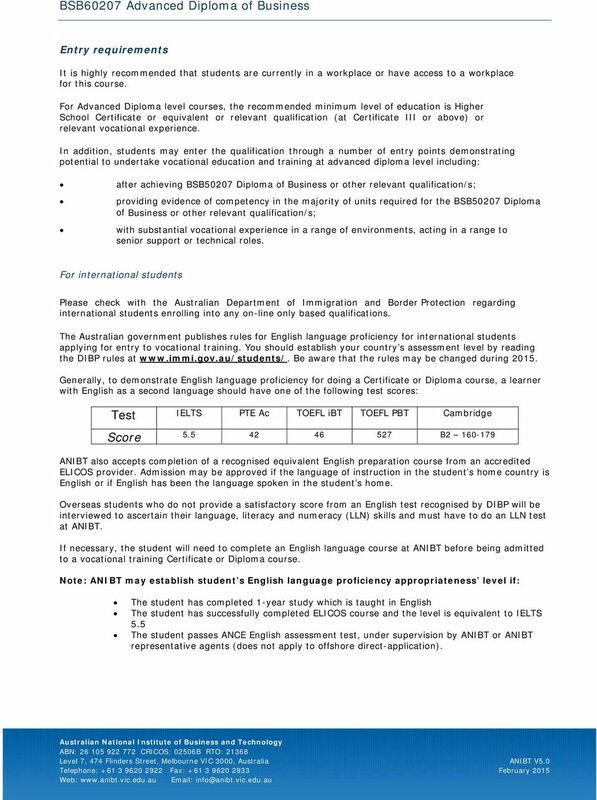 Overseas students who do not provide a satisfactory score from an English test recognised by DIBP will be interviewed to ascertain their language, literacy and numeracy (LLN) skills and must have to do an LLN test at ANIBT. If necessary, the student will need to complete an English language course at ANIBT before being admitted to a vocational training Certificate or Diploma course. Note: ANIBT may establish student s English language proficiency appropriateness level if: The student has completed 1-year study which is taught in English The student has successfully completed ELICOS course and the level is equivalent to IELTS 5.5 The student passes ANCE English assessment test, under supervision by ANIBT or ANIBT representative agents (does not apply to offshore direct-application). 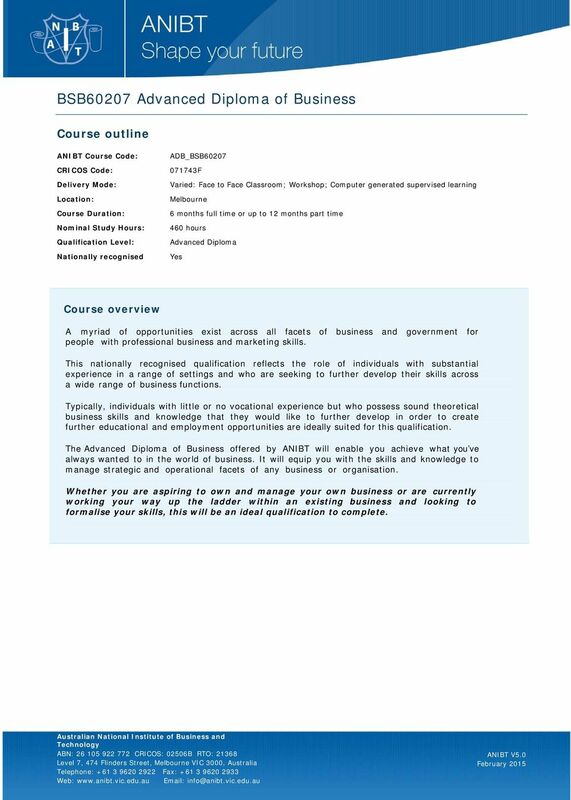 4 Course completion Upon successful completion of this course, you will receive a nationally recognised qualification BSB60207 Advanced Diploma of Business. The Pty Ltd is a Registered Training Organisation (Provider number: 21368) registered with the Australian Skills Quality Authority (ASQA). Course availability ANIBT s programs allow participants to undertake their studies in a variety of flexible ways including: Classroom* Computer generated supervised learning* Workshop Correspondence ANIBT has regular intakes for its classroom based courses as follows: *delivery modes available for INTERNATIONAL STUDENTS January April July October Term 1 intake Term 2 intake Term 3 intake Term 4 intake Please contact ANIBT to discuss your specific study and qualification requirements and how we can tailor a program to suit your specific requirements. Future pathways After successful completion of your Advanced Diploma, you will have many other study options available to you. These may include the Advanced Diploma of Management as well as a range of many other Advanced Diploma and Higher Education qualifications. Recognition of Prior Learning (RPL) Students may be able to shorten the length of their chosen course by taking into account previous training, employment experience or other life skills that directly relate to the competencies the Unit of competency is assessing. Please contact ANIBT directly on to discuss your previous experiences and we will be able to guide you through the RPL process. 5 Credit Transfer (CT) Students may be able to shorten the length of their chosen course by taking into account previous studies. 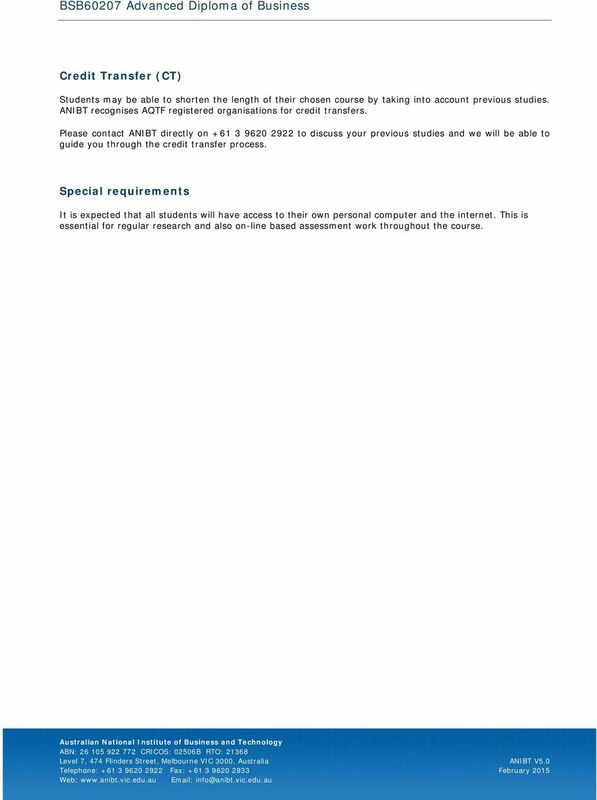 ANIBT recognises AQTF registered organisations for credit transfers. Please contact ANIBT directly on to discuss your previous studies and we will be able to guide you through the credit transfer process. Special requirements It is expected that all students will have access to their own personal computer and the internet. This is essential for regular research and also on-line based assessment work throughout the course.